I'm in this months For Keeps scrapbooking magazine. 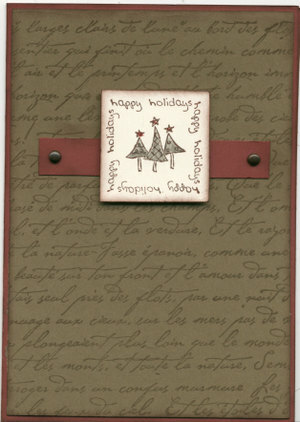 Such a simple layout, and in the heartfelt journalling section (you know how I love to talk, lol). 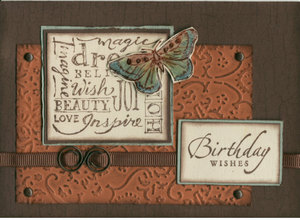 The paper and butterfly sticker (which I stuck onto white cardstock and added bling) are both by Rhonna Farrer. The white letters are Quickutz studio font and the others are Heidi Swapp. The picture was taken about a year ago when we went to Perth on holidays. Had a lovely day today. Josh and I spent about 2 hours at the Lilydale Lake having a picnic and exploring and playing on the swings. Even though it was cold, it was great to be out in the fresh air. I made a decision a few weeks ago to put Sam in creche an extra day so Josh could have a day just with me (Sam gets that time while Josh is at kinder). It's our Mum and Josh day and I think we are both really enjoying it. I took lots of photos too :). Made some Christmas cards this afternoon. I have had a migraine yesterday and today and when it finally started to lift this afternoon I just felt like sitting and creating. Does anyone else get that surge of energy after a migraine? It's weird. I also baked cookies and a cake. I never bake these days. Weirder still. Anyway, I got to make some cards. This one is for the Elite Challenges blog. The challenge was to use Chocolate Chip, Real Red and Sage Shadow. 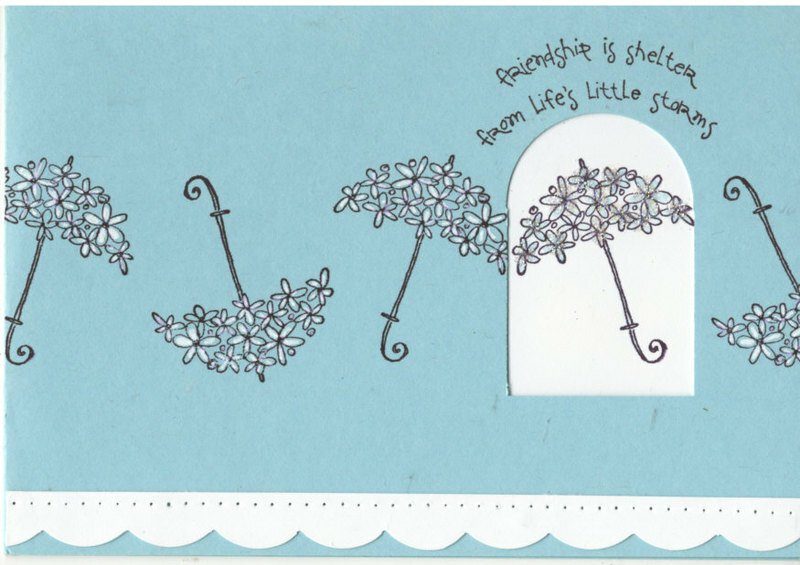 I got the idea to cut up a stamped image of the Stampin' Up! 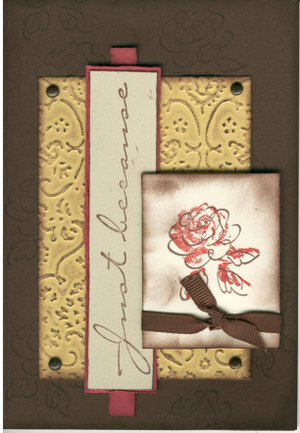 floral background stamp from one of the US stampers blogs - if anyone can remind me where I saw it, please post a comment so I can acknowledge their idea! I never use Real Red - in fact when I pulled this piece of cardstock out it was complete except for the punched circle I used to make my colour sheets. I really like it in this colour combination though! 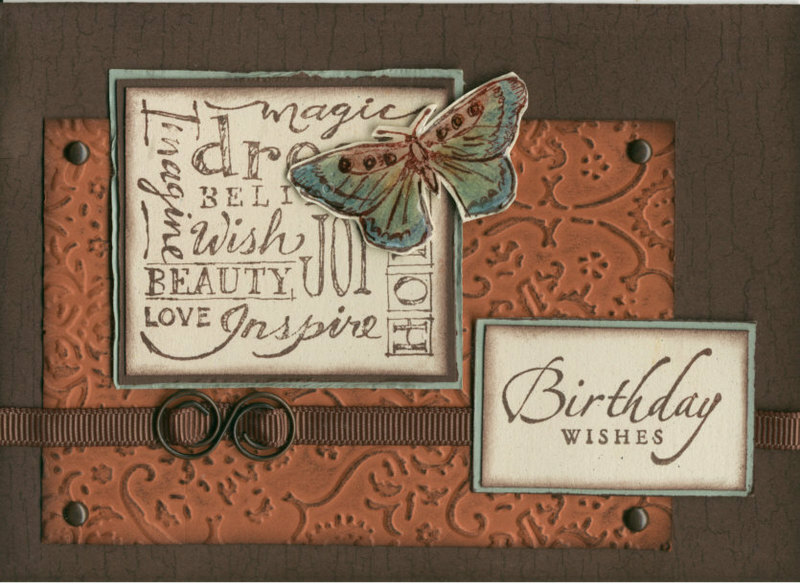 The main image is one of the sentiments form Stampin' Up! All Year Cheer 1. I went a bit funkier with this one and used Old Olive and Pixie Pink to brighten it up a bit. 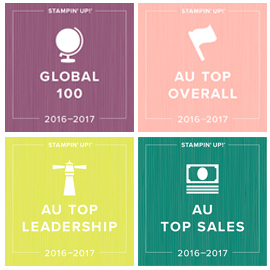 The main image is one of the Stampin' Up! standard wheels (Only Ornaments) which has been watercoloured using the pastels and a blender pen. I then covered the ornaments with Crystal Effects to give a glazed effect. 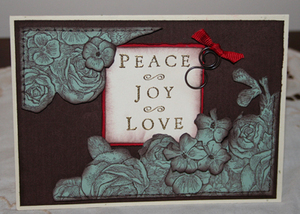 I have stamped the background with the Paisley background stamp in the same colour ink as the cardstock. 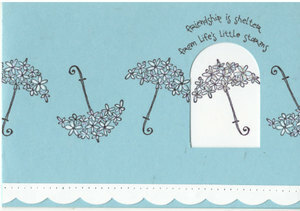 This one uses the new 'long notes' cards form the Spring Mini which is due to start selling next week. These cards are a great size (perfect size for the jumbo wheels) and I like the way they open. They also come with their own envelope (which I have stamped to match) and you get 10 cards and envelopes in a set. This one is Sahara Sand, and they also come in Cool Caribbean and So Saffron. 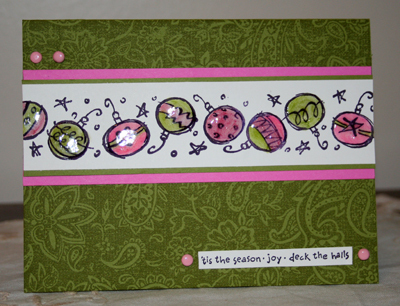 I used the Snow Flurries stamp set (also from the Spring Mini) and the cute little tag is from Terrific Tags hostess set, which can be yours free with an order of $300 between friends! Finally, this one is a variation of the first card using three background stamps (Weathered, Paisley and Floral) and Cranberry Crisp cardstock. Very traditional colours for Christmas. Hope you are all having a good week. 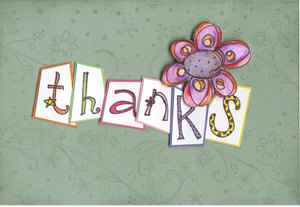 I hope to get a scrapbook page done tomorrow using some of the new spring papers, so will post that tomorrow night. I can hear thunder outside as I type this, so it may be a good day to stay inside and play. I had promised Josh a trip to the park to ride his bike, so hopefully the sun will shine long enough somewhere during the day for us to get that in. is coming on August 1st. I received my preorder yesterday and just had to add it to the layout I had allready uploaded, so here you go again (bit like 'spot the difference' hey?). I love this punch. The rounded bit adds an interesting touch. You could also cut it straight if you wanted. Imagine the uses - layouts, cards, mini books. 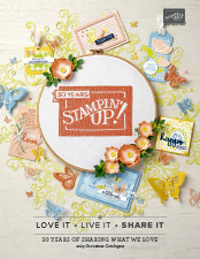 It's in the new Stampin' Up! Spring Mini Catalogue. Email me and I'll send you one for free. OK, it's late and I have to go to sleep. 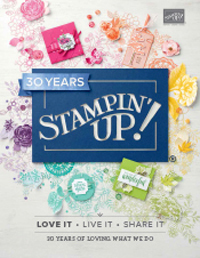 Nothing like new stamps to get a girl excited :) The new Stampin' Up! Spring Mini Catalogue is here. The catalogue contains newly released sets and these can be purchased between 1st August and 30th November. 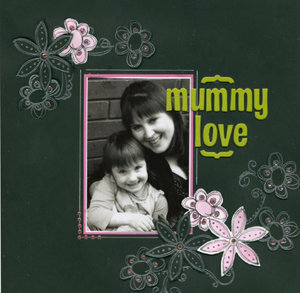 It's a beautiful catalogue, with over 30 new card and page ideas as well. I will be mailing these out free of charge to my existing customers and I could send you one too! Just email me your name and mailing address and it will be in the post! I think one of the hottest sellers will be the Scribble This set and the matching jumbo wheel and alphabet. It's so funky and lends itself to fun colouring of the doodled images. This layout was made using the Scribble This set. I love the super crisp image it gave. I embossed the images with silver embossing powder and then scattered a few I had stamped in black and watercoloured with the Watercolour Wonder Crayons. Then added some bling and a title. I didn't make this card. 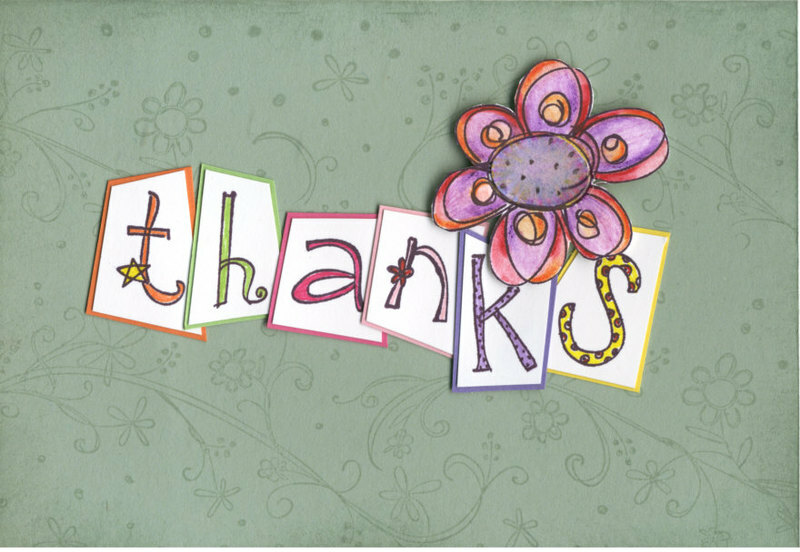 Tina (another demonstrator in our team) made it and sent it to me as a thankyou for a swap I am hosting. I think it's so beautiful I just wanted to show you. 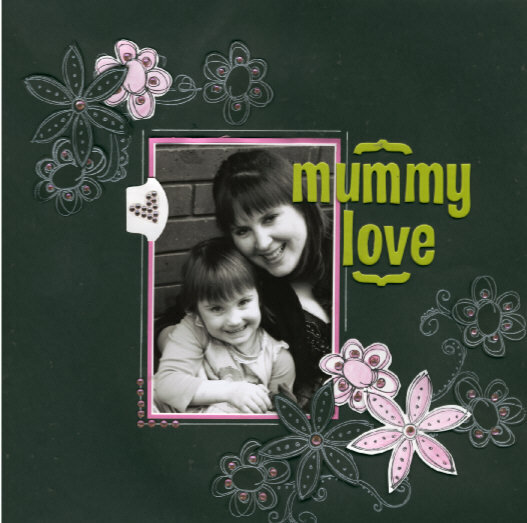 Tina has used the Scribble jumbo wheel as the background and then the Scribble Alphabet and one of the flowers from Scribble This as the main images. It's beautiful Tina, thanks for sending it. Brrrr - it's been freezing in Melbourne this week. It even snowed not far from us today. Good weather for creating. I've been playing with my Cuttlebug again. 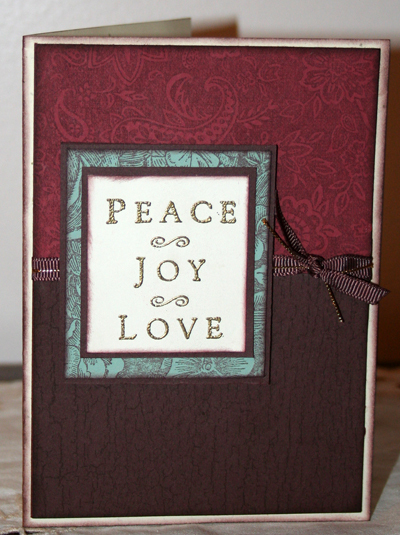 Love the crispness of the embossing and the effect you get by rubbing ink over the embossing. I can't wait to see what new folders they bring out at CHA in the US at the end of this week. Here's some cards I came up with today. 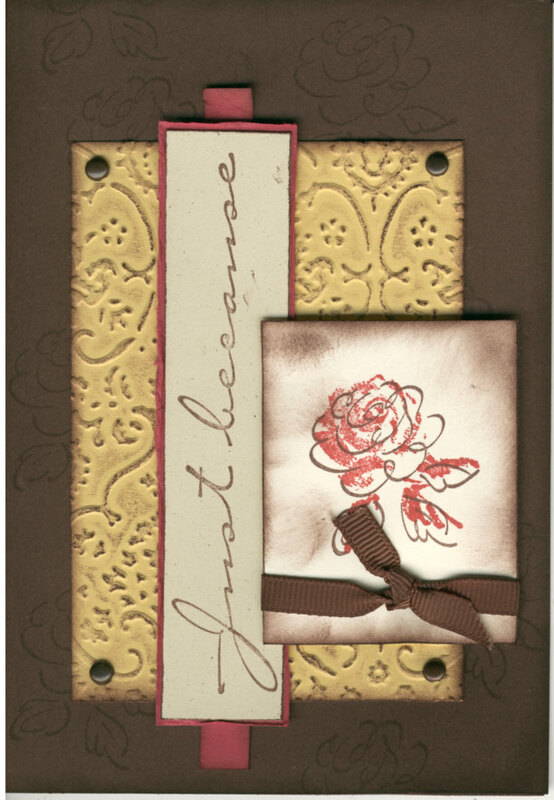 This first one is using Stampin' Up! Natural Beauty set. I watercoloured the butterfly using the Stampin' Up pastels and then I covered it with Crystal Effects. I am loving my butterflies and birds at the moment. This one uses the Stampin' Up! Simple Sketches set. 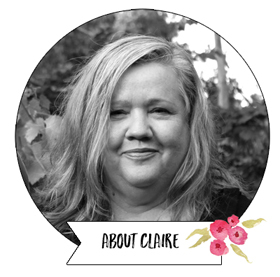 This would have to be one of my favourite Stampin' Up! colour combinations - So Saffron, Rose Red and Chocolate Chip. 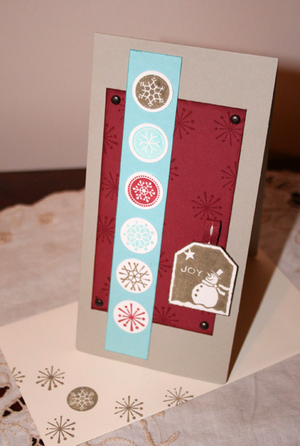 This one is just a quick Christmas card using the Stampin' Up! French Script background stamp and the 'Happy Holidays' sentiment from the Figures of Speech set. It was so quick, I will be making more of these. I received this lovely card from Marelle today, which she included with some cards for a swap I am hosting. It's gorgeous don't you think? The Umbrella in the white window has some Dazzling Diamonds glitter on it but is a bit hard to see in this scan.